People are always exploring new ways of treating ailments and illnesses, and the field of substance abuse treatment is no exception. In particular, people who are interested in a whole-body treatment modality often seek out addiction treatment programs that provide holistic methods of managing various elements of the treatment process. There are varied opinions about the effectiveness of holistic treatments; however, many treatment programs incorporate holistic elements into research-based treatment programs to enhance their offerings. Still, it can be helpful for people who are seeking this type of treatment to understand what works, what might not work, and what types of holistic programs to look for. A definition provided by WebMD states that holistic medicine is a treatment modality that considers the whole person when providing treatment. The “whole person” part of the definition means including elements of treatment for the body, mind, emotions, spirituality, and even environment when putting together a treatment plan. Based on these elements, treatment is designed to involve the person in managing various areas of life and applying healing principles to each area. The central philosophy of this treatment modality is that the body has innate healing capabilities, and treatment is designed simply to cause those capabilities to engage, bringing the body, mind, emotions, and spirit back into balance and therefore into that person’s complete picture of health. Applying this to drug addiction, holistic treatment seeks to provide a variety of techniques that all work together to bring the person into balance, helping to eliminate cravings and creating a lifestyle and personal environment where drugs are no longer needed or desired. The belief is that these practices can help calm the mind, heal the body, soothe the emotions, and strengthen the spirit, together creating an environment that can better help the person to manage triggering situations and decrease cravings. The challenge is that there isn’t a lot of scientific research behind these practices. As a result, how well they actually do what they are said to do isn’t known yet. An article from Psychology Today indicates that there is little known about the effectiveness of the treatments. While some, like meditation and yoga, do seem to help for measurable reasons – such as lowering stress levels, which can help manage triggers – others do not have a lot of empirical support. Some of the therapies might help simply by making the individual more willing to enter treatment, while others may have no effect at all. Because of this, it is important for those who are looking for these elements in a treatment program to research both the practice and the facility providing the care. By weighing pros and cons of the treatments and the practitioners, an individual entering drug treatment can be more assured of whether or not the alternative therapy will actually help. A major area in which holistic treatment can help addiction treatment, as described in a chapter from Meditation – Neuroscientific Approaches and Philosophical Implications, is through stress reduction, as well as effects on the dopamine system. 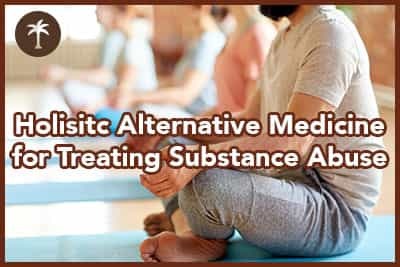 Meditation, yoga, prayer, and other holistic practices have been shown to benefit the dopamine system, which is implicated in the development of addiction when drugs throw it out of balance. Stress relief can also help eliminate some of the triggers that might otherwise lead to relapse. In addition, nutrition and exercise programs can help the body’s neurochemistry by providing needed nutrients, and boosting hormones and neurochemicals that provide natural pleasure, making it less likely that the person will crave drugs. As mentioned in the Psychology Today article, some addiction treatment professionals and researchers caution that until more is known about these methods of treatment, it cannot be known whether some of them are potentially dangerous. A person who decides to pursue holistic treatment should be aware of this possibility before entering a holistic program. Meditation and prayer are commonly used at treatment centers, and they are seen to be beneficial because of the scientific evidence behind their effects on stress levels and brain chemistry. The availability of other therapies depends on the treatment center. When looking for a treatment center, aim to find one that offers research-based practices to ensure that treatment is more likely to result in positive progress toward recovery. Centers that offer holistic therapies are more likely to have a positive effect if those methods are combined with traditional therapy and practices that have been shown to lead to more positive success rates, such as Cognitive Behavioral Therapy, 12-Step group participation, and treatment based on the American Society of Addiction Medicine’s recommended practices and placement criteria. Combining these traditional treatment elements with holistic methods can provide a rounded treatment approach that meets the specific needs of the individual, enhancing the chances that they will emerge from treatment with the ability to avoid relapse and maintain abstinence for the months and years that follow. Disclaimer: This article is provided for research purposes only. Desert Hope may or may not offer the types of therapies described in this article. If there is interest in any type of holistic treatment, it is recommended that the individual call to find out about available therapy options.